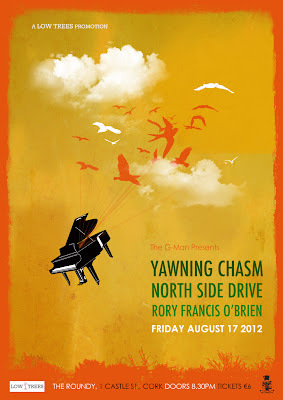 The second ever The G-Man Presents... showcase takes place on Friday with Galwegian drone folkies Yawning Chasm, neo-classical visionary North Side Drive and Ten Past Seven guitar prodigy-turned tale-smith Rory Francis O'Brien all setting up camp in The Roundy. Friday evening is a bit of an exclusive in itself as the Castle Street celebrations will see Yawning Chasm officially launch their third brand new original EP of 2012 in the alluring form of 3. Stream Yawning Chasm's as-yet-unreleased EP 3 in its entirety below. The winner will be announced on Thursday, 16th August. Closing date is 11.59pm (or 23.59) on Wednesday, 5th August.